The Chief Executive of World Rugby Brett Gosper has risked a further backlash from Scotland supporters by joking that under-fire South African referee Craig Joubert “may have needed the bathroom” when he sprinted off the pitch at Twickenham. 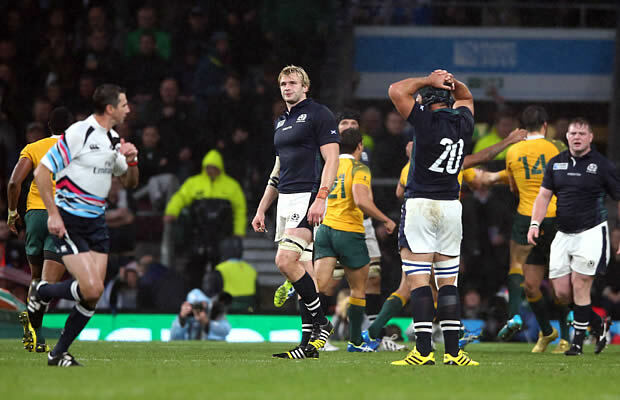 Joubert awarded Scotland a controversial penalty which effectively cost Scotland a place in the Semi-finals and handed Australia a 35-34 victory in the fourth quarter final at Twickenham. The incident occured in the second last minute of the match and immediately after blowing the whistle for full time Joubert sprinted across the field and into the tunnel which is highly unusual as the players and assistants usually remain on the field for a handshake after a contest. Rugby fans across the world have taken to social media slamming Joubert for the conversial penalty and even more so for the manner in which he exited the field. One fan was so enraged at the manner in which Jourbert exited the pitch that he threw a plastic up at the referee. Commentators and former players have also slammed Joubert for his performance with several demanding action from World Rugby on Joubert by never allowing the referee to be appointed again. Fans have demanded answers World Rugby and on BBC radio at the Beyond Rugby event Gosper was asked why Joubert uncharacteristically sprinted off the field he said he “may have needed the bathroom”. “I haven’t spoken to him,” said Gosper when asked about Joubert’s performance. 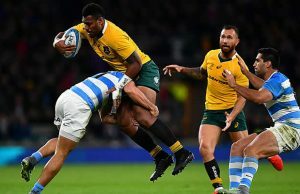 Rugby fans have been enraged by a number of the official rulings at the Rugby World Cup and the inconsistencies from the citing officers and suspensions But Gosper said that he has been pleased with the officials performances. “What I would say is that the standard and level of refereeing has been phenomenally high at this Rugby World Cup and they have worked very hard at this tournament,” said Gosper. Gosper added that perhaps the crowd at Twickenham had contributed to Joubert’s exit. “It was a very vocal crowd. As a referee I’m sure he sensed a bit of hostility and who knows how that affects behaviour? But he’s a superb referee and he has been for a long time. There will be reasons for whatever Craig did. While Gosper has taken the politically correct line with regards to Joubert in not criticising the match officials match pundits from all sides have slammed the referee in the aftermath. 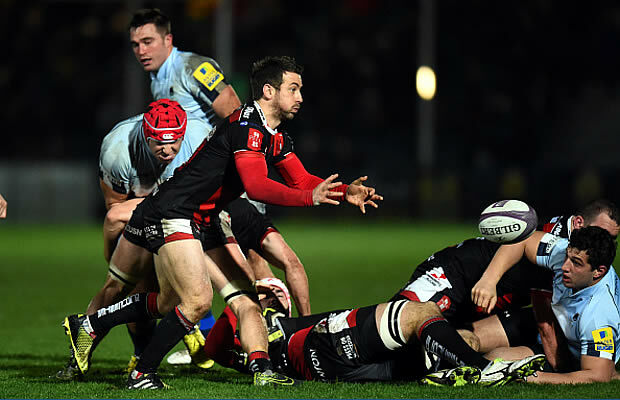 Former England scrumhalf Matt Dawson said Joubert’s actions were ‘disrespectful’ and ‘despicable’. Former Scotland international Gavin Hastings said, “That is the worst thing I have seen on a rugby field in a long time,” Hastings told BBC Radio 5 live. “That is not the spirit of rugby. He should be sent home tomorrow and he should not be allowed to make an international rugby commitment again. If Gosper thinks that the officiating standard has been high,then he should be removed from his position.Most of the knowledgeable people I have spoken to think that it has been very poor.The Top Brass all require some in depth scrutiny.There are to many penalties & yellow cards for relatively minor offenses.Players are being yellow carded for barely touching a player above the shoulders.This is a MANS GAME,not a game for LITTLE GIRLS.Stop all the political correctness,YOU are ruining the GAME WE LOVE. Unfortunately Brian we have to agree. for the pinnacle of the game the standard of refereeing has not been what everyone expects. World Rugby have also shown great inconsistency in the citings and suspensions and even the appointments of officials at key times such as the appointment of Australian Scott Nowlands as a citing commissioner for a Scotland match when their next match was against Australia. I have some sympathy with Joubert over his decision (but not with his after whistle sprint) but by then there should have been a penalty (and yellow or red card) for the late shoulder charge on Hogg. Why have we had no criticism of the TMO and silence from the citing commissioner? This is a valid point Douglas. Ben Skeen was the TMO and he brought Maitland’s “offence” to Joubert’s attention. One has to wonder why he was so quiet in the Hogg instance. As for the rest, Joubert dug himself a hole by sprinting off in that matter. It clearly suggests that he knew he had made a massive mistake. One feels another ref might have played on through extra time to give Scotland a chance to redress the error. One ref played nine minutes of extra time two weeks ago.